FRANKFURT, March 17 (Xinhua) -- Anastasiya Sizikova, a young woman who lives in Germany's western city of Dusseldorf, could have hardly imagined a few years ago that her career and life would be so ly linked to China. "I'm a happy person, because I truly love my job and enjoy doing it," Sizikova told Xinhua. "Through the example of China Rail Express, we can see how fast the cooperation between China and Europe is growing, we are proud to be part of this process," Sizikova said. In the meantime, the BRI cooperation has been playing an increasingly important role in deepening China-EU comprehensive strategic partnership, which has come a long way since its establishment in 2003. Since it was proposed in 2013, the BRI has been bringing tangible benefits to both Europe and China. Gradually growing into an iconic brand in Europe, China Railway Express, which connects 59 Chinese cities with 49 European cities in 15 countries, made 6,363 trips in 2018, surging 73 percent from 2017, according to the China Railway Corporation. Those freight trains have rumbled along the routes, taking garments, auto parts, chemicals and other Chinese goods to European consumers, while taking back European food, machinery, equipment and timber. For Spain, China Railway Express not only connects Madrid with China's eastern city of Yiwu, but also provides a better opportunity for the two countries to access and explore each others' markets. "Yiwu is a great global bazaar, and for the enterprises in the community of Madrid, it's also a big door to enter the huge Chinese market," Francisco Aranda, vice president and spokesman of Business Confederation of Madrid, told Xinhua. The Foundation for the Exchange between Yiwu and Spain, a non-profit organization founded in 2016, recently announced that it will invite some 70 Spanish entrepreneurs to present their products at the Yiwu Imported Commodities Fair in late May this year, in which Spain will be the guest country. For Poland, one of the largest agricultural countries in Europe, the China Railway Express is a good alternative for sea transportation as it helps Polish companies bring more competitive products to the Chinese market. "That would be a great opportunity to start with fresh, short shelf life products that currently can't be delivered to the Chinese clients. It could also improve the frequency and efficiency of deliveries," said Malgorzata Cebelinska, trade director of Poland's leading dairy company Mlekpol. Seeing robust growth in the Chinese market in 2018, Mlekpol is now one of the leading players in the sector of imported milk to China. She noted that her company is considering expanding business activities and range of products in the Chinese market. 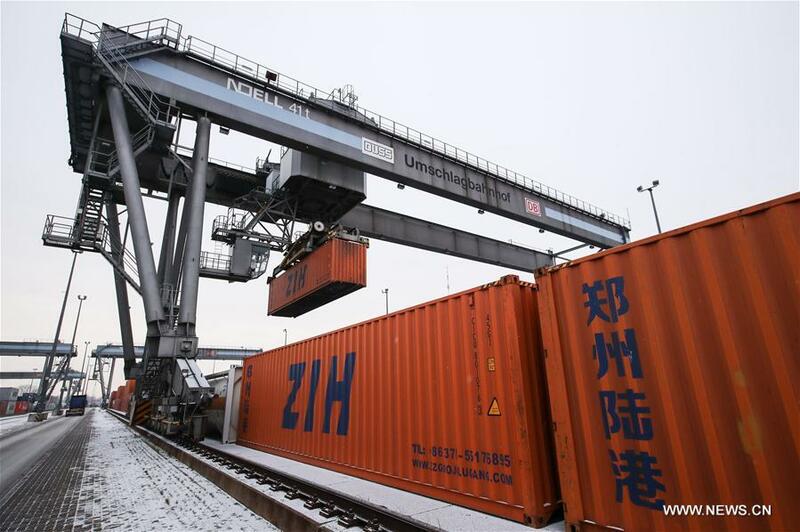 "The freight train service between China and Europe is a powerful example of how the Belt and Road cooperation can drive common development and prosperity of China and Europe with enhanced connectivity," Yang Jiechi, a member of the Political Bureau of the Communist Party of China (CPC) Central Committee, said at the 55th Munich Security Conference in February. While guiding European companies' to growing businesses in China, the BRI also directly leads to new investments and jobs in Europe. The Piraeus port, where China's COSCO Shipping has investment, is an exemplary case of win-win partnership between Greece and China within the framework of the BRI. The port started to take a new look and achieved impressive results a few years after the Chinese investment came, in the wake of the debt crisis that hit Greece hard, Vassilis Korkidis, president of Piraeus Chamber of Commerce and Industry told Xinhua. "It was an investment for more than 3.5 billion euros (4 billion U.S. dollars). There are a lot of activities around the port that were activated by the port development. So that means new jobs, better-pay jobs than the rest of the workers' salaries in Greece," he explained. The Peljesac Bridge, one of the biggest infrastructure projects in Croatia's history, is another example of win-win cooperation under the BRI. Croatian Prime Minister Andrej Plenkovic said China Road and Bridge Corporation's active participation in the construction of the projects "is a concrete economic contribution." Hungarian Prime Minister Viktor Orban also highly valued the presence of Chinese companies in the country, saying that they have contributed to the full employment and the long-term economic growth of Hungary. As an important global public goods by China, the BRI keeps winning more and more positive feedback throughout Europe. Michel Kempeneers, chief operating officer of overseas export and investment department at Wallonia Export-Investment Agency, told Xinhua that Belgium is very open to Chinese partners in terms of the BRI cooperation. "We can have win-win partnerships together, talking with our Chinese colleagues with the same language of openness," said Kempeneers, adding that Belgium is not an ending point of the BRI, but a new starting point for the rest of Europe and "we welcome these flights and trains from China with a lot of happiness." Thilo Ketterer, a public auditor and partner at the German professional service firm Roedl &Partner, has followed the BRI from the very beginning in 2013 and took part in the first Belt and Road Forum for International Cooperation in 2017. The initiative, which brings everybody together, is "really fantastic," said Ketterer. He was deeply impressed and encouraged by the fact that the initiative has turned from vision into reality. In fact, the BRI cooperation is extensively accepted as a major part of bilateral relations between China and the European countries. Spanish Prime Minister Pedro Sanchez said that Spain will actively take part in the construction of the Belt and Road, which is of historic significance as China and Spain reached consensus last November to jointly push forward the construction of the Belt and Road to strengthen Asia-Europe connectivity and boost global trade. In addition, Greek Foreign Minister George Katrougalos said Greece will actively participate in the BRI and play a constructive role in promoting the bilateral relations and Europe-China cooperation. From the perspective of the EU as a whole, there is growing synergy between the BRI and the Juncker Plan, a 315-billion-euro (357 billion dollar) investment scheme championed by European Commission President Jean-Claude Juncker in 2014 to boost private investment in European infrastructure projects. "I would like to witness the further development of success stories of the Belt and Road Initiative, to see more countries getting involved, to see new infrastructure development along the route, and to see growing cooperation between China and Europe," said Sizikova.